Coeur d'Alene is a beautiful peaceful and fun place to spend your vacation. No matter what the season is, there is so much to do in Coeur d'Alene and the beauty is timeless. Travel throughout the area by bicycle or walk to dining, shopping, parks and the city beach. Para-sailing and air tours are just steps away from your rental. Excellent and diverse dining, shopping and cocktails are available along our beautiful Sherman Avenue and activities can be found at many places along the way. 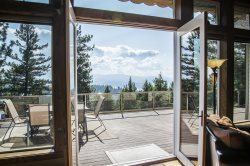 You are in the heart of Coeur d'Alene's Resort district lined with beaches, mountain views, walking and biking trails all nearby your luxury vacation rental or your private beach front home. Coeur d'Alene has fine dining and wonderful food to satisfy any appetite and the quite residential streets make you feel at home.